ThinkBean for sponsoring my Commerce 2.x, which helped get this initiative wrapped up. Shawn McCabe at Acro Media for working on the product tests and the other remaining tests. With Simpletest, there were two test suites (kind of): web test and unit test. However, I do not recall seeing any of the latter in the wild because it could not communicate with the database. In Drupal 8 we now have four different test suites, each with specific purposes. Unit: You are testing class functionality, and mock other required services. See DefaultStoreResolverTest as an example. Functional: Functional tests are tests which require a fully bootstrapped Drupal and provide browser emulation via Mink. This test type will look familiar to those who have worked with Simpletest. See StoreTypeTest as an example. Tests live in the Drupal\Tests\$module\$type namespace (e.g. Drupal\Tests\commerce\Kernel) and tests/src/$type folder (e.g. tests/src/Kernel). We will cover how to setup PhpStorm to run Drupal Commerce's tests. 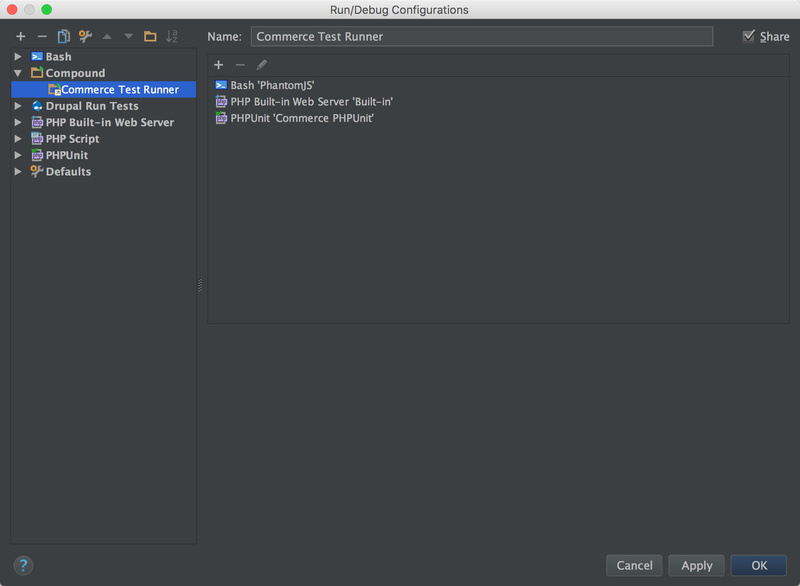 PhpStorm provides a PHPUnit test runner and lets you stay within your workbench to run tests. I run my tests using PHP's built-in server and SQLite. This allows you to run tests with a minimal environment setup. The first step is to copy the phpunit.xml.dist shipped with Drupal. Make a copy and name it phpunit.xml. There are three values you will want to adjust in the <php> section of the configuration file. SIMPLETEST_BASE_URL: The URL the Drupal site can be viewed at. SIMPLETEST_DB: If the site is not installed, or is different than the default database connection. You can use SQLite for testing, which is my primary use case for setting SIMPLETEST_DB. Below is a sample of what the configuration changes would look for the environment settings. The first step is to create a PHPUnit Runner. 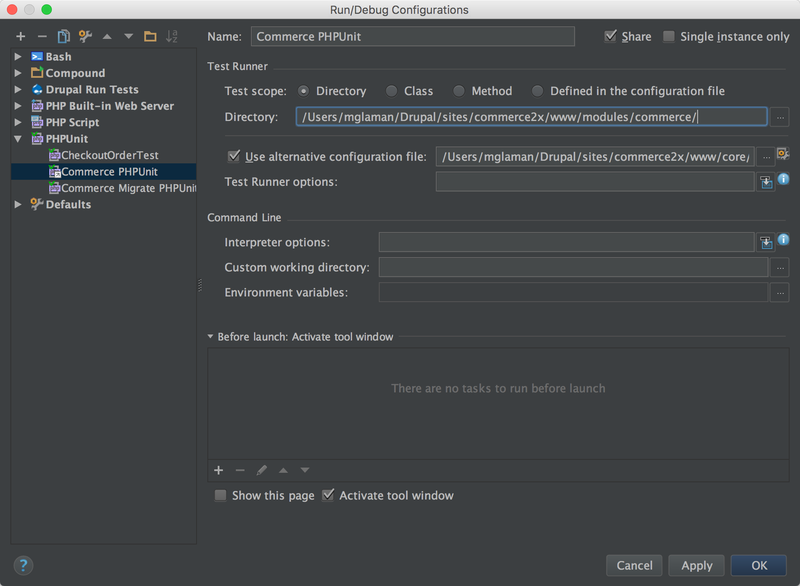 Visit Run -> Edit Configurations and create a new PHPUnit runner. You will want to have it configured to look for tests inside of modules/commerce (or wherever you put Drupal Commerce, e.g. modules/contrib/commerce.) Then change the configuration to be base on the one you created previously, such as core/phpunit.xml. Drupal expects PhantomJS to run on a particular port with seeded configuration. 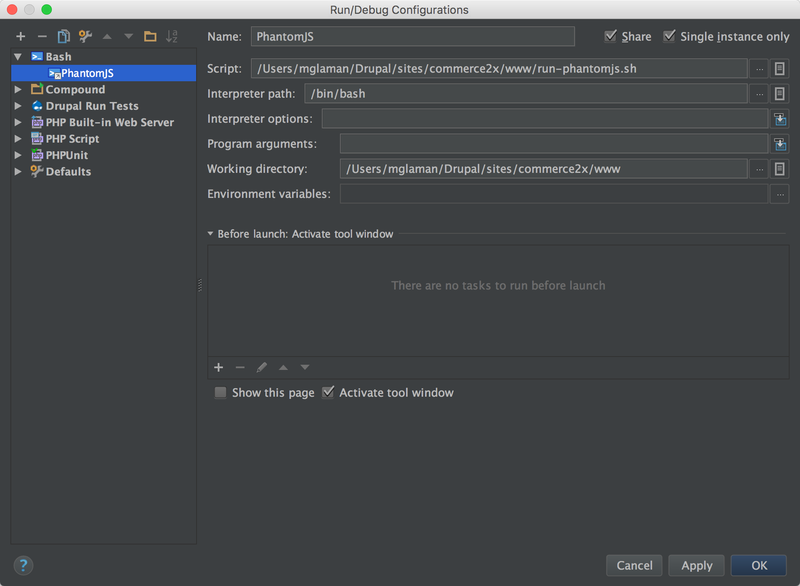 The IntelliJ platform does not have a PhantomJS plugin yet, so I recommend writing a Bash script, and then a Bash runner. Note: You will need to install the BashSupport plugin in order to have this runner. 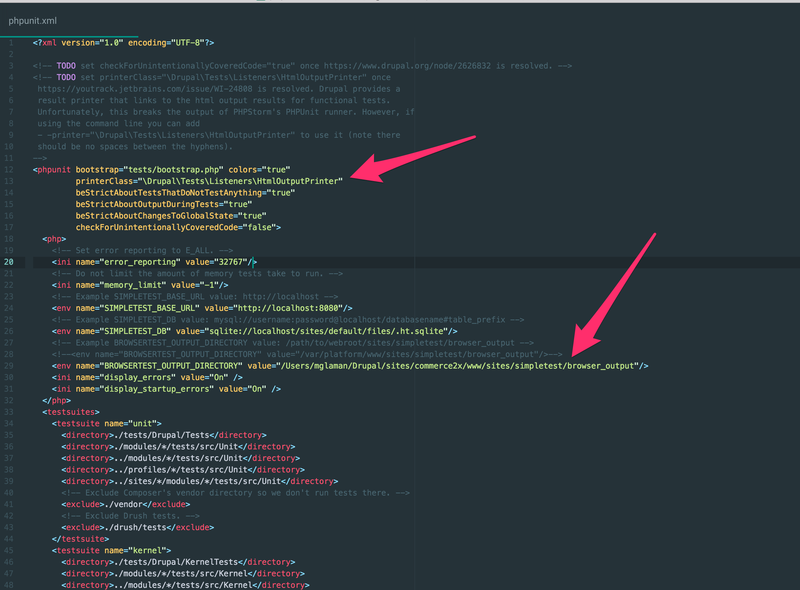 The above line starts PhantomJS as the Drupal tests assume it will be running. You then just need to add a configuration to have PhpStorm execute the script. Note: I am currently working on an IntelliJ PhantomJS integration plugin to make this easier. As stated, I run my tests using PHP's built-in server instead of booting up my Docker containers. In fact, this is how our tests run on TravisCI. 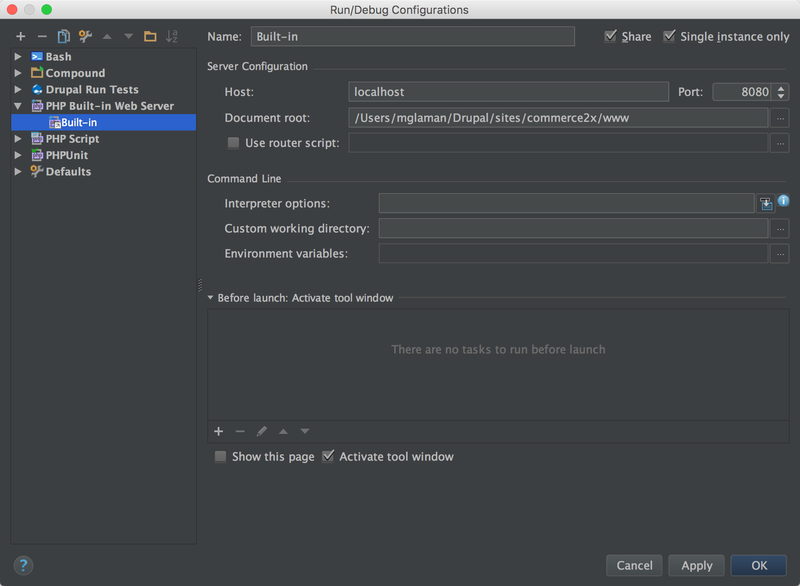 Create the runner and configure the domain and port. I like to be lazy efficient. We just created three different items that need to be running to execute the test suite. PhpStorm has a way to group runners, so they execute at once. I recommend making Compound runner that executes all three of the runners. Thanks Matt for this post. Bash is available after installing end enabling BashSupport plugin. If you want to use sqlite with an existing site, so a settings.php is already configured, you have to remove/rename settings.php file. Otherwise, phpunit will return errors as drupal is already installed. It's great that you're investing in this now. In the future it will be a huge help in finding out bugs and keeping a steady pace when advancing cool stuff. Phpstorm Built-in Server has some issues with rewrite and urls containing dots like admin/structure/types/manage/article/fields/node.article.field_address. To fix this, the only solution i found is to use a router for phpstorm. And configure Built-in to use this router script checking "Use router script" and filling path to script.